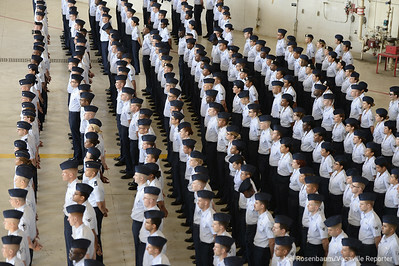 United States Air Force personnel wait for an Assumption of Command Ceremony for new base commander, Jeffrey W. Nelson to begin Tuesday on Base. 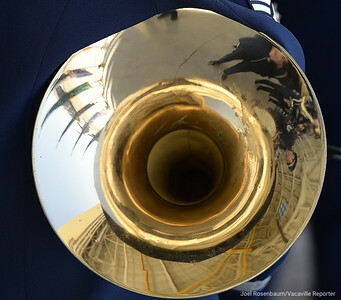 The interior of the hangar is reflected in the bell of French horn held by a member of the United States Air Force Band of the Golden West during an Assumption of Command Ceremony for new base commander. 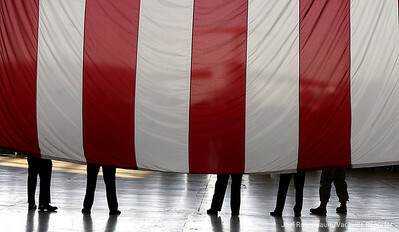 Col. Jeffrey W. Nelson Tuesday on base. 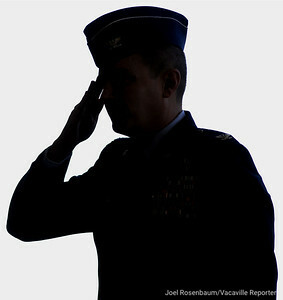 United States Air Force Chief Master Sgt. 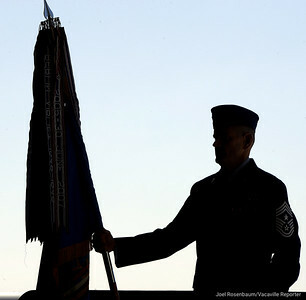 Derek Crowder, command chief of the 60th Air Mobility Wing at Travis Air Force Base stands at ease as he holds the command guidon during an Assumption of Command Ceremony for new base commander, Col. Jeffrey W. Nelson Tuesday on base. 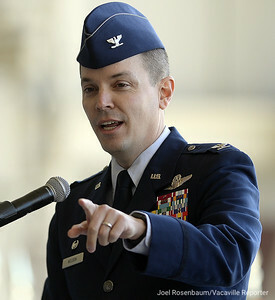 United States Air Force Col. Matthew A. Leard smiles as he is singled out by USAF Maj. Gen Sam C. Barrett during his remarks. 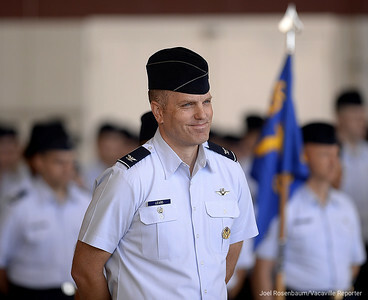 Col Leard is the Vice Commander of the 60th Air Mobility WIng and was the base's interim commander after the previous commander, Col Ethan Griffin was relieved in August after he was placed under investigation for alleged "personal financial misconduct." 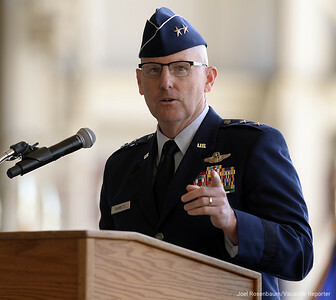 United States Air Force Maj. Gen. Sam C. Barrett, commander of the 18th Air Force, Scott Air Force Base, Illinois delivers his remarks Tuesday as he leads an Assumption of Command Ceremony for new the new commander of the 60th Air Mobility Wing at Travis Air Force Base, Col. Jeffrey W. Nelson. 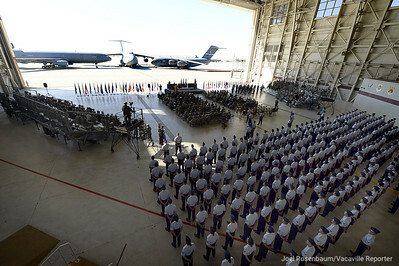 Filling a maintenance hangar at Travis Air Force Base, United States Air Force personnel of the 60th Air Mobility Wing along with dignitaries, family and friends gather to hello to new commander, Col. Jeffrey W. Nelson during an Assumption of Command Ceremony Tuesday in Fairfield. 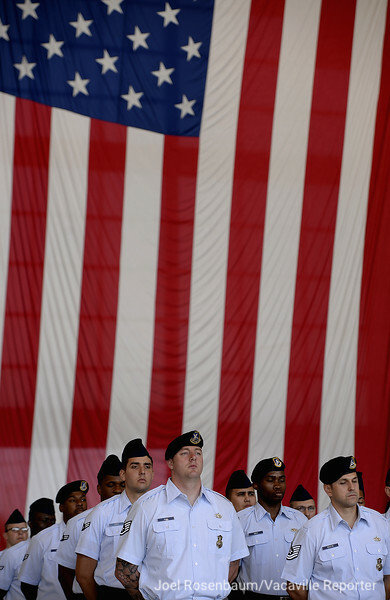 Col. Nelson takes over command after the base's previous commander, Col. Ethan Griffin was relieved of duty in August pending an investigation for alleged "personal financial misconduct." 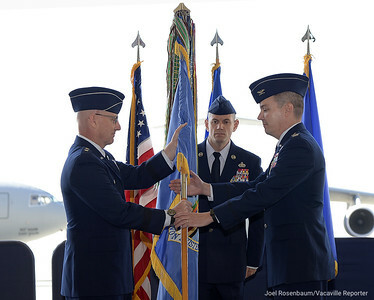 United States Air Force Maj. Gen. Sam C. Barrett, Commander, 18th Air Force passes the command guidon to Col. Jeffrey W. Nelson as he assumes command of the 60th Air Mobility Wing at Travis Air Force Tuesday during ceremonies on base. Col. Nelson takes over command after the base's previous commander, Col. Ethan Griffin was relieved of duty in August pending an investigation for alleged "personal financial misconduct." 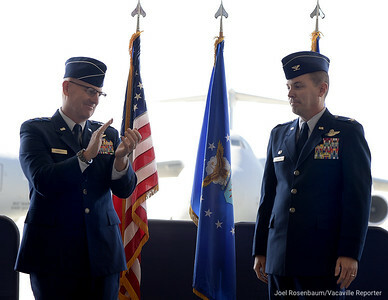 United States Air Force Maj. Gen. Sam C. Barrett, Commander, 18th Air Force (left) applauds after Col. Jeffrey W. Nelson assumed command of the 60th Air Mobility Wing at Travis Air Force Tuesday during ceremonies on base. 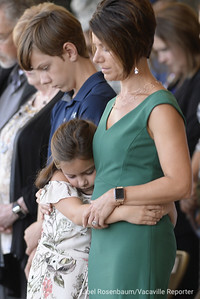 New commander of the 60th Air Mobility Wing at Travis AIr Force Base, Col Jeffrey W. Nelson points out members of his family as he delivers his remarks during his Assumption of Command Ceremony Tuesday on Base. 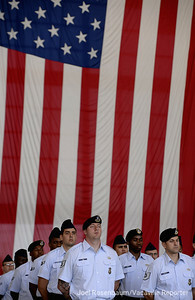 New commander of the 60th Air Mobility Wing at Travis Air Force Base, United States Air Force Col. Jeffrey W. Nelson salutes the airmen and women gathered in a maintenance hangar during his Assumption of Command Ceremony Tuesday on base. 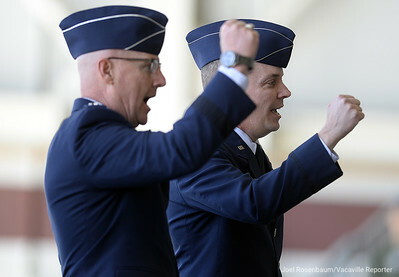 United States Air Force Maj. Gen. Sam C. Barrett, Commander, 18th Air Force (left) and Col. Jeffrey W. Nelson sing the Air Force Song at the conclusion of an Assumption of Command Ceremony as Nelson takes over command of the 60th Air Mobility WIng at Travis Air Force Base Tuesday on base.